Art works can sometimes be very straightforward and tell us a lot about themselves and their history at just a quick glance. Others can be more elusive and mysterious. The deeper you dive into them, the darker it seems. However, with research and a little perseverance what was first unclear can start to conjure strange and brilliant things. This work here initially appears to fall in the former, essentially it’s a simple sketch of a man in a costume. As a Collection Transition Assistant for the Sarjeant Gallery I came across this work amongst a large collection of World War I Cartoons waiting to be relocated to the Sarjeant’s temporary home at Taupo Quay. Quite often on the front of an artwork is an artist’s signature usually accompanied by a date and sometimes a title. For our purposes most of that information as well as a unique number for a database or catalogue is located on the back of a works frame. This is naturally where we start when we come across a work and it’s here where this work begins to intrigue. The front is graced by two different signatures one of which is dated. On the back is a title of sorts rather than just any man it is “Sir Henry Irving as Mephistopheles” and that it was sketched at a Savage Club dinner, unfortunately not the Wanganui Club but the founding club in London, with this a lithograph of that sketch. 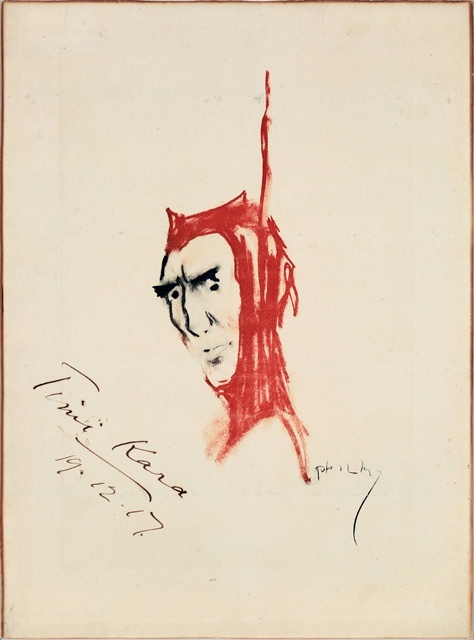 The undated signature belongs to the artist, Phil May, a well-known English caricaturist and Savage Club member. His early life and career was involved with the theatre and he was a regular staff member for Punch magazine where many of the World War I cartoons were published. His subject is Sir Henry Irving, the great actor-manager of Victorian theatre. Irving was the first actor to be knighted, regarding theatre as almost religion – calling the Lyceum theatre his ‘Temple of Art’. He didn’t shy away from new technology for playing this role of Mephistopheles, a demon from German folklore, live electricity was used to create sparks during sword fights. It would have been truly spectacular as only something this unsafe can be and it is no wonder that he inspired many artists. It was said everything about him was a gift to caricaturists and it was likely his manager Bram Stoker based the appearance of Dracula on him. The true mystery left on this work is why it’s dated and signed again. The date from 1917 is 14 years after the death of Phil May in 1903. The name Timi Kara is a name that Sir James Carroll was also known as. Sir James was a NZ politician twice acting as Prime Minister, he was the first Maori elected to a General seat and the first Maori to be knighted. He was also a Savage Club member and features in his own Savage Club sketch, by Alan Stuart Paterson, drawn as he gave his blessing to the Wellington Savage Club. Two weeks later he passed away. It is housed at the Alexander Turnbull library. It’s incredible what can be bound up in even one simple sketch from Whanganui’s own temple of art.